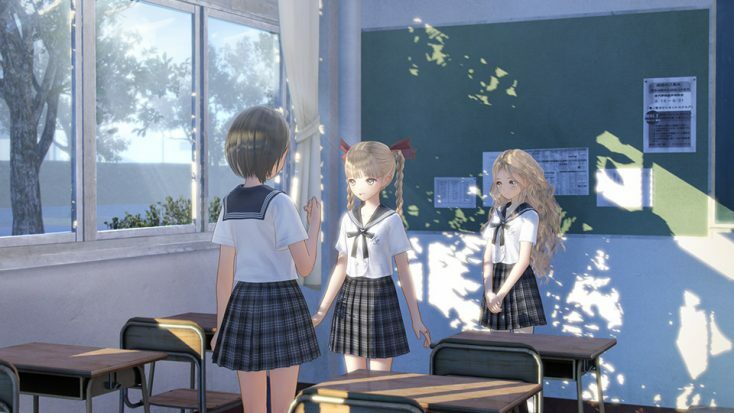 Blue Reflection was first introduced to me as the game about “sad lesbians,” a description that does absolutely no justice to the sheer torment and agony the characters are put through in the course of the game. Blue Reflection is a magical girl JRPG with a basic “only this unlikely heroine can save the world from certain doom” undercurrent of plot, but that’s certainly not the main conflict in the game. The main cast tries to act like the Sephirot (aka your villains du jour) should be considered a legitimate threat to the world, yet they are absent from the majority of the game save for a few boss battles that have been poorly spaced throughout the narrative. In reality, the biggest threats to your character are hormones and a futile quest for some modicum of happiness and meaning in life. You play as Hinako, a young ballerina whose career has tragically been cut short due to a serious knee injury. As a result, she’s been removed from the school’s special program and enrolled in normal classes. Adding insult to injury, the normal classroom is next door to the special class, meaning that Hinako has to attend school every day mere feet away from what could have been, constantly being reminded that the path of ballerina etoile is now and forevermore closed off to her. And Hinako absolutely isn’t the sort of protagonist who’s trying to stay optimistic about life and making the best of a bad situation. She’s miserable and withdrawn at the start of Blue Reflection, and throughout the game tries to dance and put weight on her bad leg because she just can’t accept that dancing is no longer a possibility. She’s physically and emotionally brittle, listlessly shuffling through her new life with very little hope of her situation ever improving. And then along come Yuzu and Lime. Yuzu and Lime are Reflectors, aka this universe’s brand of magical girls. Their mission is to keep the world from being destroyed by Sephirot in the grand scheme of things, and on a smaller scale prevent everyone in their all girls high school from succumbing to an emotional breakdown. Every student at Hoshinomiya Girls High School is at the risk of being overwhelmed by their core emotions at some key life moment, which will cause part of their soul to break off into fragments. As a Reflector, Hinako has to try and stabilize these fragments by empathizing with the girls, allowing their psyche to remain intact and providing Hinako with a small powerup to help beat back the Sephirot. Does this skirt a bit too closely to the overly emotional woman stereotype? I’d say no. Every single breakdown these girls suffer is precipitated by some major stressor or traumatic event (trying to please everyone all the time, a childhood pet dying, or becoming disillusioned with a hero who inspired your life goals, to name a few). You bear witness to the way the girls suffer and then have to make the conscious decision to try to scrape them back together after, either by beating back actual personal demons or literally picking up the pieces of their fragmented psyche. Your partners Yuzu and Lime remind you that not every mission must be completed; that is, your success doesn’t necessarily hinge on helping all of these girls. And putting them back together doesn’t guarantee long-term success; some of the main girls you ally with will have additional breakdowns later on, because high school is hard and none of us got out in one piece. If you wanted to (or were simply feeling particularly lazy), you could absolutely leave a few of these women emotionally shattered. The choice is up to you. How powerful do you want to become? One of the best parts of Blue Reflection was the overt acknowledgement that none of the main three are trying to help these girls out of the goodness of their hearts The explicit main reason Hinako gets involved with Yuzu and Lime is because there’s a strong potential for personal gain as a magical girl. Yuzu and Lime inform her early on that if the Reflectors can successfully beat all the Sephirot and save the world, then Hinako can have one wish granted to her; namely, the restoration of her bad leg. Furthermore, whenever Hinako is in her magical girl form she can run and jump again with the kind of ease and mobility that she hasn’t enjoyed since before her injury. There’s no risk to her physical well-being either, since a team KO by the demons only sends the girls back to the real world, safe and sound. There’s a high chance of reward with very low risk, so why wouldn’t she take it? Lime wants to help stabilize the girls after their breakdown to gain whatever fragments or other powerups could be acquired only after they’ve suffered this internal trauma, and while Yuzu seems conflicted about this manner of doing business she never actually tries to stop Lime. In Blue Reflection, certain victory can only be gained through copious amounts of human torment. Of course we can’t have a selfish protagonist for the whole game, and eventually Hinako begins to show a softer side that’s capable of human bonding and friendship. But when Hinako openly starts to care about the girls she’s meeting on this journey, the close friendships and meaningful relationships you’d expect (or possibly hope for) are almost nowhere to be found. Hinako primarily expresses confusion or exasperation around others, suggesting that all those years she focused solely on ballet have taken a massive toll on her social skills. She fumbles her way through conversations which ultimately lead nowhere, and it hurts to see her try so hard and consistently fail. There’s a mechanic where the player can wander around school collecting different topics to text friends about, which on the surface sounds like a great way to get the girls to bond over common interests. Yet so many of those text chats include so variation of “I don’t get it” or “I don’t really understand” that you end up feeling like the endeavor might have done more harm than good. You bond with these girls, but there’s a concrete and lasting distance between you and them. There’s always something tentative about the alliance; for example, you can use the girls as backup in boss battles, but only until they take too much damage and flee. They’ll come back eventually, sure, but you’re always worried that one more hit, one more negative experience, is going to be enough to drive them away from you for good. Blue Reflection is a game that, at its core, is unhappy and lonely. The halls in the school are sparsely populated by a handful of students, while teachers never appear on screen. Either Hinako’s parents are the epitome of workaholic culture or they’ve completely abandoned their daughter for being a failure of a ballerina, because I never got so much as an offscreen line of dialogue from them. Your one-on-one time with some of the girls can feel forced, and picking the wrong dialogue choice will lead to an awkward conversation instead of bonding and increased affection. There was even an odd moment where Yuzu and Lime explained to Hinako that although they were in the same year, they weren’t twins. Like the game wants to emphasize that there’s a little more distance between the characters than you’d expect. Like none of them are ever as close as you’d think or want them to be. 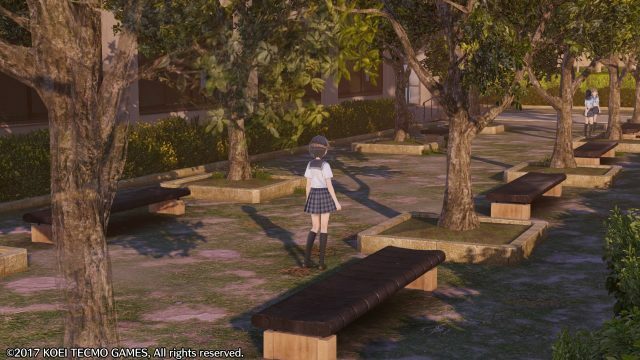 The real world of Blue Reflection is dull, empty, and tightly packed together. You spend your days cycling between different parts of the school building and perhaps passing the afternoon hanging out with one friend at one of the few spots in town you can visit, over and over and over. It perfectly encapsulates the repetitious hellscape of high school life, offering battles against the emotional demons as an out for a young woman desperately looking for anything that could break up the monotony that dictates her normal existence. The Common (aka emotional demon world) is by contrast bright and colorful, a gorgeous foil to reality with the tradeoff of being replete with monsters and scattered shreds of human consciousness. The levels start out just as compact as the school but gradually sprawl out as your abilities and powers grow, allowing you more freedom to trounce about and explore a realm so far away from the dull sameness that comes with high school in the real world. But at a certain point the worlds of the Common become convoluted and twisted upon each other, happiness mixing with fear or rage and sorrow becoming entangled with each other. And when you start to find items like “Hidden Grudge” or “Suicide Impulse,” you begin to wonder if maybe that smaller, safer world wasn’t the better option. Hinako herself suffers even in victory. Most of the connections she makes with the other girls are born from dark feelings of disappointment or fear. She empathizes with them not through any sort of positive bonds but rather shared suffering. It’s as though Blue Reflection feels the need to remind you, again and again, that Hinako can only forge connections to the people around her as a direct result of the hardships life has inflicted upon her. And some of the girls are too dark even for Hinako to handle. Following her initital confrontation with Mao, Hinako remarks that she wanted to bring out Mao’s joy for acting to bridge the gap between them, because that was the only speck of beauty she could find in the girl’s entire soul. What does that say about a person if the only time they seem approachable and capable of human connection is when they’re pretending to be someone else? I loved this game because it understands that misery and despair is a painful reality for many. There’s no glossing over your suffering for the sake of putting on a happy face, nor does it treat emotional trauma as a minor inconvenience that can simply be ignored until it goes away. Blue Reflection acknowledges that there is only so much we can do to improve our lives and the lives of those around us, and sometimes we simply can’t win. It’s sad, it’s sweet, and although it can get a bit repetitive (particularly towards the end) I enjoyed it. If you’re looking for an emotional JRPG, Blue Reflection is a pretty good pick.